Chessington Community Colleges JamPod™ installation was undertaken in August 2013 and is a joint project between the College and Kingston Music Service. How did you come to engage with Mix Music Education and how have they helped you in your classroom? When I started working at Chessington in 2007-08, resources were not much more than a pile of semi-working keyboards. As part of the re-building of the school, under the Building Schools for the Future project, I was equipped with a PC music suite. 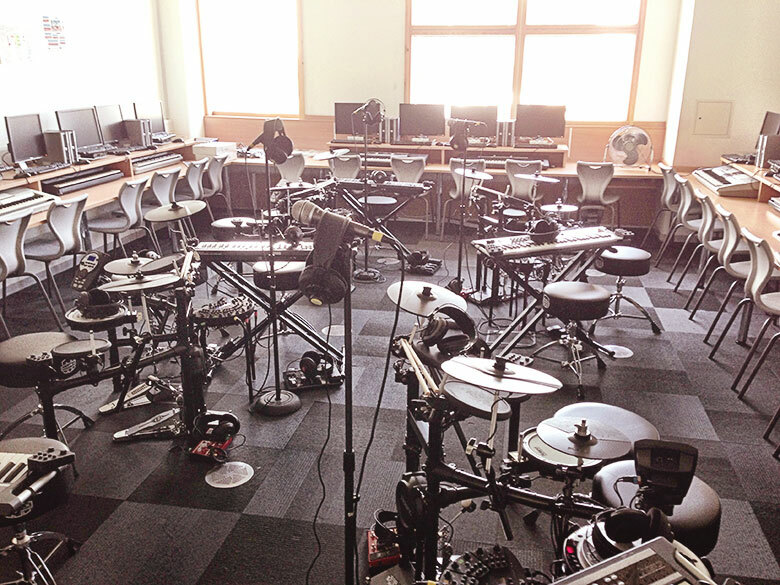 The students could engage with digital workstations as performance and a composition tools. However, instrument lessons haven’t matched the take up in GCSE/BTEC and A level. Instrumental work was the preserve of those fortunate enough to have parents with the inclination and the money to pay. My students were not getting the chance to play real instruments in standard, classroom music lessons. I shared this frustration with my local music service and they lent us a class set of ¾ size classical guitars. A year later, the Kingston head of contemporary music came in for a chat and asked, “Have you heard of JamPod?”. I had just read about the “JamHub” mixer and was very interested in this could be used in the classroom. Very soon, the talk became more about siting the equipment in my school and developing the means of paying for such a large project. Why did you decide to embrace JamPod™? The Kingston head of contemporary music, Jason, and I went on a day trip to South Wales to visit the Duffryn High School in Newport. This site shows what is possible when a Music Service and School work together successfully. It was an obvious model for us and we gained a lot talking to the wonderful people who lead that project, learning what went well and what went wrong for them in their early days. All I had to do was see it for myself to be without doubt – JamPod works. For these and other reasons, we decided to approach a local charity to help with funding the project. The Humphrey Richardson Taylor Trust are based in Sutton (a neighbour Borough). They exist to support education and technology projects in the community – not solely school developments but places where all the local residents can come to make music. Our project is exactly the sort of thing that they support and thanks to their generosity, our plans could become a reality. We could not have done this without them. For me, JamPod meant that Chessington could take a giant leap forward in my ambition to create and sustain a centre of excellence for Contemporary Music. We can become active partners in our local Music Hub and provide a unique musical resource for the entire Borough. JamPod links with what we had and provides numerous new opportunities for both teaching and learning. Are these new approaches helping you tackle challenges previously difficult to overcome? How has JamPod™ effected your own teaching? Last summer I was able to attend an afternoon INSET course delivered by the “head of Music for Ofsted”, Mr Mark Phillips and Charles Hazelwood. Mr Phillips’ presentation was called “Mind the Gap”. It focused on the Ofsted findings that fewer than half of the lessons observed in 2012 actually focused on practical music making. He carefully pointed to the data to show that what goes on in music classrooms appears divorced from the experiences observed in school concerts, productions and in the “real world” of the music business. Thus, a Gap between Music Education and Music Experience has appeared. With JamPod, I can now reply: “What gap?”! Music lessons are just that – students learn Music. The language of learning is what and how to play, to create, to explore, to record, to craft. It’s not theoretical chalk and talk –its hands on doing. Students are free from the dominance of the keyboard as the central means of performance – drummers can drum, guitarists can strum and singers can hum (or sing…of course…). I talk less – about 5 minutes admin time and 5 minutes to set up the lesson. Students are actively engaged for 40 to 45 minutes out of an hour. I spend more time working with small groups or one-to-one, demonstrating and suggesting ideas. Students smile, not a bit but throughout a lesson, obviously enjoying what they are doing. Some are reluctant to leave – I have even had students turning up after school on a Friday to play until 4 o’clock! The music room is full every lunch time and it would be at break if I was willing to work through that as well. We have already had a large number of students showing interest in instrumental lessons, with some parents willing to pay for lessons too. Running group tuition, we have been able to offer lessons at a huge discount: one to one tuition costs £17.70 per ½ hour with the Music Service but only £6 an hour for small group tuition in the JamPod Academy. The flexibility is amazing. You can work individually, in any combination of small groups up to the full band of six or seven musicians. Students can experiment without the potential embarrassment of being overheard by class mates. Everyone can work at their own pace so differentiation is almost exponentially huge. I like the versatility of the JamHub itself. The internal system allows for recording, playback, a group metronome, effects to enhance sound plus many other features I have yet to explore. And it all links up to a PC via a USB link, becoming an audio multitrack interface for programs like Cubase or Sequel, Logic or Garageband. 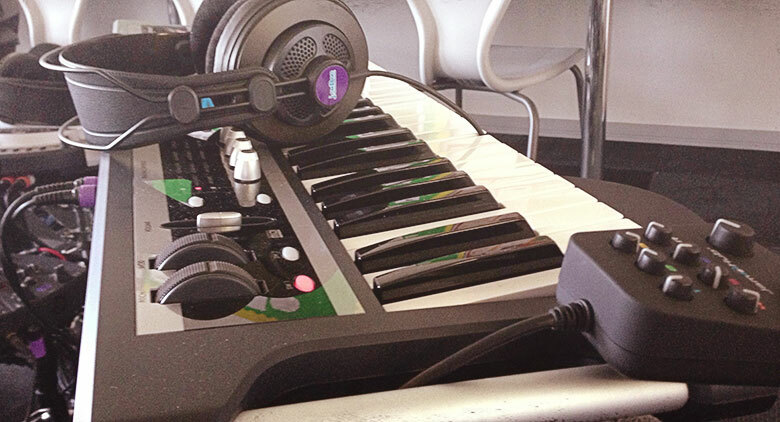 With the JamPod, you potentially add a “silent studio” to any computer you own. Has JamPod™ impacted on the school community as a whole? When we held our Prospective Parents’ Evening event, a JamPod was set up in the school foyer to welcome our visitors. When guests come to the school, they stop and visit the music room. The involuntary “wow”s and the “I wish it had been like this when I was at school”s happen every single time a new person walks into the room. Even in a newly build school with the most amazing sports and science facilities, the music suite appears to have become front and center in the shop window. The impact on the students is undeniable. 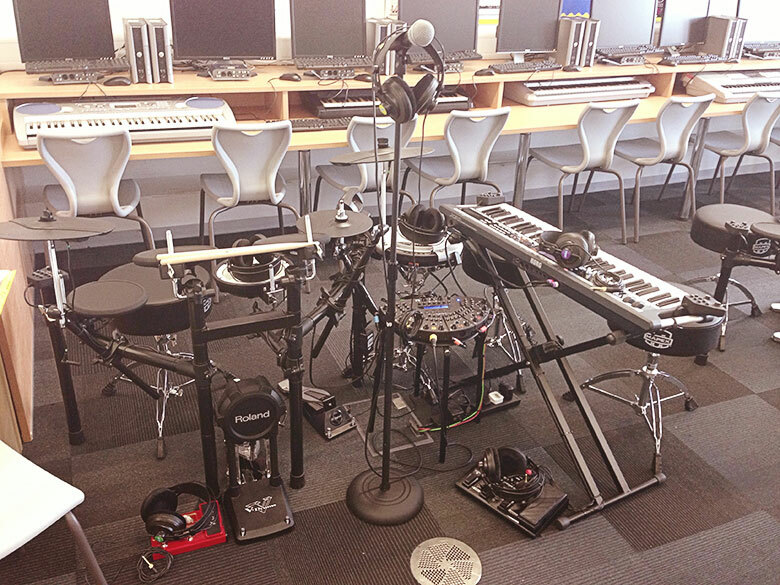 Exam students in years 10-13 are loving the way they can create music without disturbing other classes. Those who didn’t opt into Music are green with envy with students making it abundantly clear that it is simply “not fair” that we only got the JamPods this summer. The younger students in years 7 to 9 are arriving to lessons either on time or early – some have been running to get to music! Staff have visited and asked questions or had a go themselves. Some have even asked “Don’t you do any work anymore?” – I assume this is because they were enjoying themselves playing the instruments. Everybody at work is smiling, unless they have a focused look of determination as they attempt to master something that is challenging them. There is a buzz around the whole College. Not only that, but all adults who work for Kingston Borough have been sent an invitation to join an Academy class just for adults. Chessington, whose reputation in the past has been less than glowing, has become “the JamPod school”. We are going to be hosting primary school workshops and have the potential to organize team-work event days for local businesses or Borough Council groups. JamPod doesn’t just impact on the school community – it impacts on the whole community. JamPod and JamPod HD are both highly recommended. It is no mistake that the concept and the company won the “Technological Innovation” award in last year’s Music Teacher Magazine (February 2013). This is a valuable resource and one with massive potential to add to your music making whether you are a youth club, a school, an F.E. college, a P.R.U., an Adult Education center or even a University. One thing that makes this stand out as a purchase is not just the extremely low prices, but the service and after-care. Dan Jones, the Mix Music founder, is there from project conception to way beyond purchase and implementation, freely giving advice based on the experience of other schools, his own ideas (previously Music Teacher of the Year, no less!) and asking the sorts of questions that sharpen your focus and help you deliver what you both want and need in your situation. He’s not there to make money or sell-sell-sell, Dan and his team are there to help you make music in the best way to suit you in your situation, to help you turn ideas into reality for your musical ambitions. 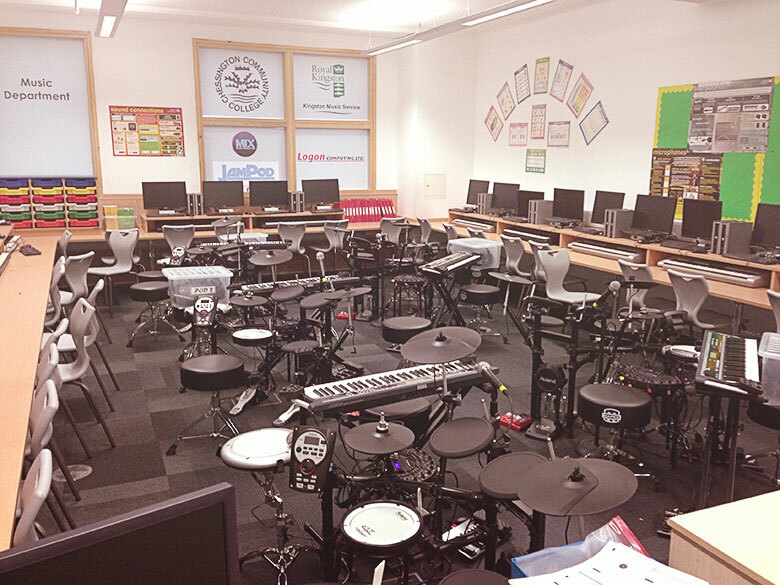 You’re not just buying a load of flashy gear, you are buying a new way to teach music, a new way to engage students, a new way to meet Ofsted criteria, a new way to encourage young people. Mix Music Education are on your side, even by your side if you need help. One extra thing – the inevitable question / statement: “Isn’t it all a bit delicate? My kids would trash that. Won’t it just get smashed up?” My answer to this is simple. The resources are there for the students. If they break them, they won’t be able to use them. If they enjoy using them, they will want to keep using them. Therefore, they will want to look after the equipment and keep it running as long as possible. 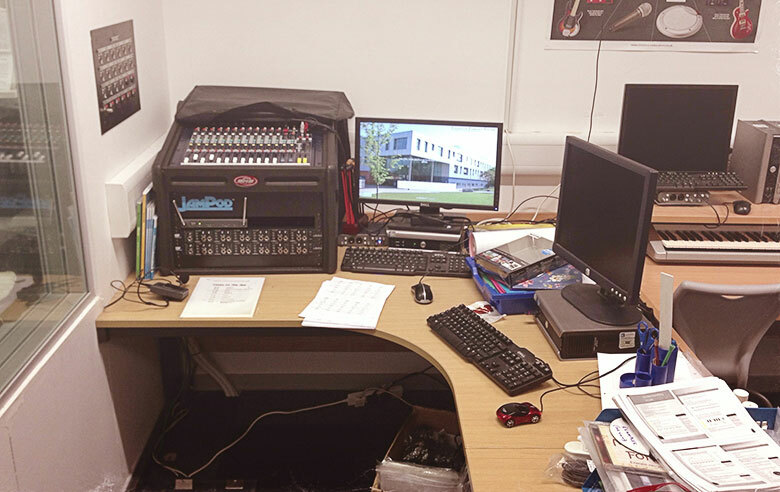 JamPod has been in use every day since the start of term, September 2013. In this first seven weeks we have had: 1 popped top E string on a guitar, three guitar leads that have stopped working (broken solder in the plugs) and two snapped drum sticks (both accidents). The year eight student who broke the first drum stick came to me in tears holding the broken stick, more disappointed in her accident than anything else! That’s five bits of wear and tear over seven weeks – less than one a week. Better than average for some school music departments, perhaps? Every single item had a spare provided by MixMusic that came along with the equipment installed and there are plenty more spares before we even have to consider buying anything. Dan Jones was a teacher in a secondary school. He knows what will last and what will just break. None of the equipment we received is flimsy or cheap quality – it is all built to last. Everything is specially selected to be durable and tough without compromising the musical standard desired.